I think I might have missed some key ideas (especially towards the end of it). I felt that througout the talk, when I thought I had lost the point, I also lost my focus as well. The improvement point is to realise when the point is lost, create a quick reminder (or leave a blank space), and move on to the next idea. I also tend to try to translate a small group of words into pictures when doodling. I need to focus more on the big picture and doodle it rather than each sentence. Practicing and increase my own "doodle library" will help me on this I believe. I liked that you worked spatially across the page vs. the more traditional vertical sketchnote approach. You have a lot of drawing here already - I'd like to see more text to ground the ideas. Good emphasis on title and use of icons. Would like to see more description along with icons - some areas are left only as icons which makes decyphering the information harder as a reader. Like the use of arrows, interesting lines etc to divide the page up. Some good light and shade on the page. Nice sketches. I especially like the series you made from the evolution of a vehicle. It looks like you concentrated so much on sketching that you hardly captured any words. Try finding a balance between the two. Words will help you to capture some of the finer detail and more specific facts. A good combination of both words and visuals has the highest impact for remembering content. I did this 15mins before the deadline when I just woke up I find it easier to concentrate even though I did not understand the lecture I find it easier in the morning. If I should improve I shall improve the speed of my drawing and generate ideas at a higher frequency. Looking at other contestants made me realise I can draw more. I like the parallel icons of the faces in profle, the robots, the cars. You are buidling a "doodle library" and it'll get better and better with experience. Perhaps a way to keep focus is to just listen for the key points and capture text. If you leave spaces, you can add images later. Really like the image of the stealth fighter carrying money over a city and the little robot icons. Content seems light, would love to see more detail in text and icons with this style - maybe larger page? Like the imagery used ... the bomber carrying a sack of cash and the robot are all great. I do think a bunch of info got missed. I know it's hard to keep up—try capturing the occasional quote inside a word ballon. Also worth practicing some interesting typefaces and basic connectors, dotted lines, bullet points etc which all keep things interesting. I like your clean sketches. Nice confident lines. You uppercase writing is nice and clear as well. You obviously struggled to capture most of the content. The three points you got down don’t quite tell the whole story. To practise, try listening to the talk several times, adding to and completing you notes with each round. Over time you’ll get better at capturing more and more in fewer rounds. I like the city scape and the connected dotted lines that allow the eye to follow the story. I think the notes work really well for me to remember the talk, but if I share it with others, I'm not sure I've captured the key elements that tell the story. I also struggle with typography and often take time afterwards to alter this digitally. I need to improve this when sketching 'live'. Zoning on this particular sketchnote seems to have been lost - a way to separate or frame the different areas is needed I think. Visually savvy piece with clean imagery and text. I don't want you to sacrifice the content for the style or details in the imagery. For example, "HOW" is beautifully rendered, but it is "stealth" that is the key point and you didn't capture the answer. Like the emphasis and drawing of Kevin in the title area. Icons and drawings are great! Lost track of the flow a little on the page at the start - arrows do help though. Wow. All of it is terrific, but the things I love the most are the masthead, the city, and the dotted line connecting the first few points. I'm scraping the barrel here. One advanced tip is to quickly google the Netflix logo (I sometimes do this on my phone while sitting in a presentation) so you can accurately draw it instead of making it up. Beautiful neat sketches and writing. Very nice title treatment with the centered portrait and banner for the title. I can see how you tried to make connections and show the flow of the story through your dotted lines and big arrows. I feel that there are some logical jumps and gaps in the notes that make it hard to follow. For example, you ask the question “What is the black box in banking?” and then make a straight connection to poker, followed by wine and the elevator button. Try not to force connections when they are not clear and create logical groupings instead. Very strong pairing of distilled content and icons. The light color for the drawings, used consistenty, works great. Usually when I see this 1:1 text to image pairing I call it "iconitis" because people get boged down in finding an icon for each and every blurb. Curious how you would use imagery to organize and structure the content if it weren't a 1:1 ratio. Vertical columns to show flow work well. Like the icon supporting text. Light blue seems a little light - may work better in a little darker blue. Feels like columns 1 and 2 are heavy and 3 is lighter w/ content. Maybe balancing out the 3 columns would help there. Rather than worry about what might or might not be important, make a call on what's important to you and make it bigger and bolder there and then. At the moment everything looks like it's sitting at the same level, so some more solid areas, larger text and variety would make it more visually interesting. Very nice balance between words and sketches. Your sketches are simple and clear and I like the personality you injected in some of the sketches, such as the little smiling computer screens. You also captured a real good amount of detail. Apart from the three words in a black frame, your notes are very even. I’d like to see more visual hierarchy and structure to show which points are key and how the individual elements are related. Try using different sizes and weights of writing for different levels of hierarchy / importance. You can also try to use colour to pull out main ideas, in both writing and images, instead of using it to separate words from sketches. The thing I like about it is the monkey sketch. Though it was not specifically mentioned by the speaker, the ideas of algorithms producing ratings and, in the future, movie scripts, made me think of that saying of how a thousand monkeys typing endlessly would eventually produce all of Shakespeare works. Algorithms as frantic, learning monkeys. Problem might be is that I added an idea that wasn't mentioned by the speaker but generated by me. What I would do better next time - choose a smaller size of paper! I did the sketch on a paper size slightly bigger than an A4 page and I had problems scanning it. I find it difficult to know in advance how much space you'd need to capture all the ideas of the talk. Building a visual vocabulary with repetition of icons like boxes and brains. Because I work as a graphic faciliator supporting a group, I'm not a big fan of creating all new imagery, like your monkey. Because it wasn't generated by the speaker or seen/heard by the audience. But if it supports your personal meaning making as a sketchnoter - go for it! 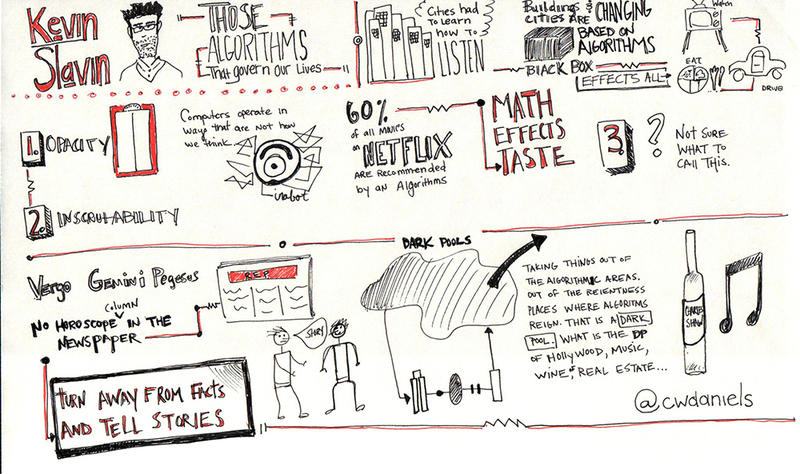 Like the use of imagery on this sketchnote. Would like a bolder title area and flow. I'm not sure where to begin, so I would assume top left - no clear flow from section to section. Lovely illustrative style. LOVE the typing monkey and duelling numbers! You can clearly draw, so why not have a stab at a simple caricature of the speaker up the top? Also, I'd make the presentation title larger and more prominent. It's a bit lost as is. I really like the creativity and interpretation in your sketches (such as the fighting numbers and the writing monkey). You can increase the clarity of your sketches by using single continuous lines instead of piecing them together with lots of little lines. Another tip for writing within a frame (like you have in some of the black boxes and the Roomba: write first, then draw the box / shape around the writing, because for some reason, no matter how big you make the box, the words will never (or even just) fit the box if you do it the other way round ;) You could also start playing with some structure between the different items to show which ideas are related. What I like is the overall layout. What I would like to do better is add some more pictures or symbols. Strong structure with parallel paths and lists of supporting ideas. Putting aside drawing images, how could you build on your strength with structure by varying text size, color and style to support meaning? Very expressive work - I feel like you were really thinking through what Kevin was saying, working out those ideas on paper here. Structure is confusing and hard to follow. Some of the red highlights add to the confusion as a reader (though for you this may make perfect sense). More drawings would be better. I like the shapes that the various containers create. I'd make an effort to leave a bit of whitespace. It's pretty darn busy here! You mentioned incorporating more imagery, which I agree with. I'd also experiment with different sizes of text, all caps, practice some decorative typefaces, other connectors like dotted lines, arrows etc, rather than relying on a container around the text to break it up. You captured a lot of detail! I like the energetic feel of the sketchnote and the restriction to just two colours. Your sketchnote is quite busy and very text heavy. You tried to use some of the red lines and circles to connect thoughts, but as the underlying note is already so busy, I don’t think it actually adds clarity. I’d suggest a few things: Try using different sizes of lettering to distinguish key points from explanatory details. Leave more room between individual points. Don’t add too much structure (like frames and connectors) up front. You can always add them in later in the talk when you have a better understanding of the overall structure. Try making the leap to sketching every now and then. To start, you can pick out simple words from the text and just visualise them literally (such as, ‘Box’, ‘Grapes’, ‘Brain’). When you feel comfortable with making the switch back and forth between sketching and writing, you can move on to more conceptual sketches. I'd also like to improve my layout. Slavin introduced three things he wanted to talk about: opacity, inscrutability, and "a third thing," but I didn't write down the second item, so I missed the cue for when his talk smoothly segued into the second point, and kept trying to cram more stuff into the space under the first point (thus the sideways text). Arrows were useful for tying it all together, but the end result is a bit of a soup. Very curious what this looked like after the first 30 minute listen. With the total of 60 minutes you got nearly every point within a very structured layout. If you are looking to do more synthesis and draw conclusions, try buidling in buffer space at top, bottom or sides to summarize the story, themes or highlights. 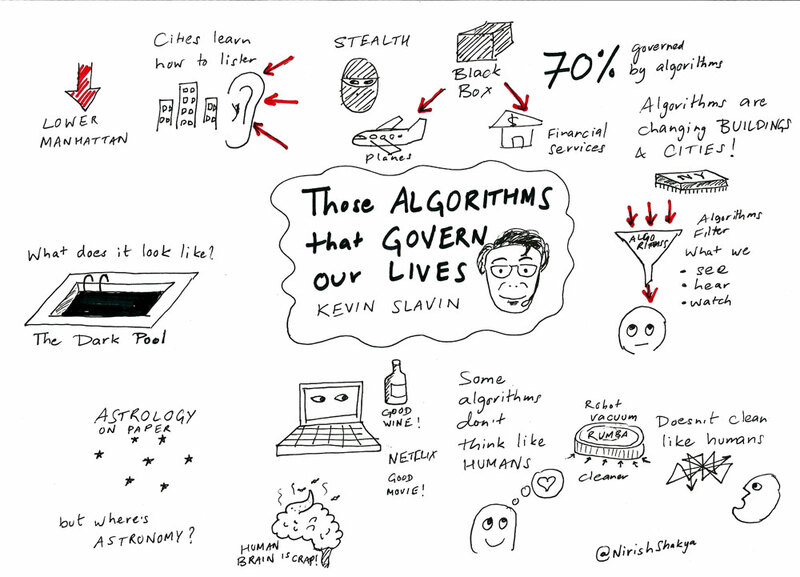 Fabulous sketch of Kevin and emphasis on the title so I know who is speaking and what they are talking about. Really like the pink highlights. Nice use of illustration. Nice typography as well. I like the 1 2 3 column structure, though it seems as I go downward, the columns are blending together a little. Is that intentional? I am not sure as a reader. Bottom also seems more tightly packed than the top. Massively impressed. Love the masthead and the killer portrait of the speaker, the variety of typography in play, the use of colour, the negative space used for the words 'dark pools'. All of it, really. And it's subtle but I notice the attempt to write Netflix as a logo. The extra time was well spent IMO. Scraping the barrel here. Perhaps consider adding a light grey marker for shadows and shading, to bring depth to some of the larger sketches. 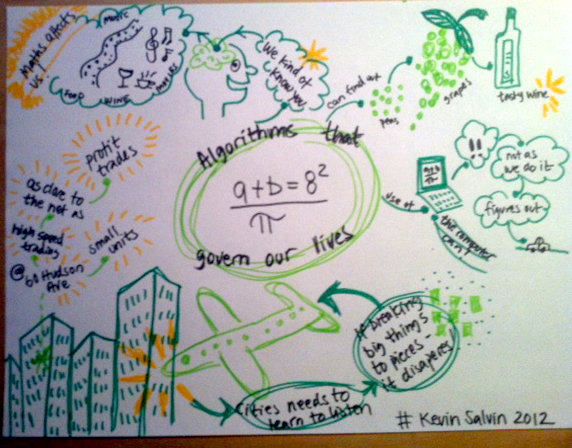 Very nice sketchnote! I love the 2-colour restriction, the clear prologue + 3 column structure in the second part of the talk and the quality of your sketches. Nice treatment of the title and portrait, too. You are already sketchnoting on a really high level, so the improvement is in the details, always pushing to make things even clearer, better structured and more concisely summarised. Working on the speed of your writing and sketching helps a lot to free up more time and brain capacity to concentrate on all those things. and the reverse text for "Dark Pools"
Not jamming things together so much... I realized some of the salient points after starting up the next point, and had to shove them in a bit more than I wanted. I work with a Japanese fold book, so shouldn't get so tight with my space. As I was in "waiting for the speech to start" mode, I thought I'd work the title into some sort of mathematical equation, but didn't really go the way I hoped. As things were laid out in the presentation, I also thought there would points 1, 2, and 3, with 1 being "Opacity", but then didn't really hear the other two... so "Opacity" is set up as a heading, but with no brethren. Strong use of words as imagery, ex. Opacity, Distortion. The title is confusing. Too much action going on in it that doesn't support meaning. Like the bold look and gray highlights, illustrations are nice too. Somewhat unclear of the structure other than top to bottom - maybe numbering or indicating a flow would help. The title is a little messy for me, and just too big relative to everything else. You mentioned it didn't go to plan. Kudos for trying to work the math aspect into it though! Also I thought the list of things that computers see differently was a missed opportunity for some simple imagery (music, food, investment, dating, movies etc). Also maybe experiment with a colour highlight next time. I like your balance between sketches and written details. I also enjoyed your playfulness with the lettering (Opacity, Distortion and Dark Pools). The grey shading works nicely for give the page some depth and subtle contrast. The title seems to grab too much attention in the whole page. It’s very big and has a lot of arrows going on that actually don’t mean anything. The spacing in the first half of the page is nice and open but it gets a bit crammed in the second half. Try keeping the nice spacing up until the end, even it it means you have to start a new page. You can always stitch several pages together after scanning. I think I managed to capture the main points. It's more visual compared to my regular notes that I take, which are mostly text-based. I like my sketch of the 'crap brain'. I used the entire sheet pretty well. Not get nervous under pressure! The "crap brain" and dark pool are very powerful. Content feels dispersed across the page, it doesn't hang together as a whole. How could you use groupings and flow in a lighter color to tie it together? Love the Dark Pool sketch and that you have gone for it sketching Kevin. Like emphasis on the title area in the center. Feels like there could be more information captured around the icons here, red highlight feels inconsistent (a lighter color used across the whole piece might be more effective). Flow seems unclear. I'd work on your typography. Practice drawing some decorative typefaces, varying the size of your letter forms, and consciously aligning elements on the page. Quotes are also useful to capture, either with some fancy talking marks or in a speech bubble. I like the nice open spacing with the different points arranged around the title in the middle. Very nice clear sketching as well. I love the dark pool and the metaphor or the algorithms als a funnel shaped filter for what goes into your head. You could add a bit more detail to each captured point, making it easier to tell the story that connects the different ideas. You could also try to group some of the points together at the end (by using connectors or frames) and labeling these groups with a summarising keyword or statement to make it easier to get the big picture in a glance when looking at your sketchnote. One thing I like about this is compact nature of the notes. I like the economic use of space. Also, this is the first time I tried adding color to my notes and I enjoy the added effect. I'd like to improve my use of spacing. While I like it all compact. I ended up with a lot of white space at the bottom. I'd also like to improve live sketch-noting and figure out some ways to move fasters and keep up with the speaker. Solid first use of color and the images support the content well. Capture more content by spending less time on block letters. Like the clear flow, title emphasis and drawing of Kevin. Red highlight seems stronger than I would like - maybe something lighter/brighter? Not liking the image clipping on top of the scan. I like the layout and the use of electronic elements (resistors, terminals etc) in the line separators. The caricature of the speaker is great too, and the colour highlights work well. Don't feel compelled to capture everything visually. Words are important too—they could be concepts that resonate with you, quotes that you latch onto (represented in quotation marks or speech bubbles). Practice drawing a couple of decorative typefaces so you can use them on a whim. Love the portrait of Kevin. I also like the separators with the zig-zag elements in the middle. They suits the data / automation theme of the talk. You started out a bit close to the top edge at the beginning and ended up with lots of room at the bottom. Don’t be afraid of leaving enough breathing room for each item even at the beginning of a talk. You can always switch to a second page should you run out of space. Try working a bit on your block lettering. If you pay attention to a more even spacing between the outer lines it will come out a lot neater and more readable. framing things. Like the limited colours but do not like the framing. The ugly yellow "blobb" in the upper left corner..., gahh! What was I thinking? The pieces close to the "brain" ==> messy and inconsistent. The boldness of the big imagery on the page that connects and flows with content. Perhaps make your framing easier by picking 1 color for all of the framing in sketchnote. Another darker color for the drawings. Then the iconography can pop forward and the framing can recede. Like the bright colors used here. Interesting overlap of colors and images as well. Feels as though lots of the details aren't captured in this single page. Scale of page to information makes me think a larger page would better fit your style. Flow of the sketchnote isn't completely clear. I like that it's colourful, and the layout you've used with the title at the centre. Not sure about the equation at the centre. It would be nice to perhaps see a caricature of the speaker in the centre there instead, given the equation doesn't directly relate to the talk (unless I'm missing something). Also the plane appears to be flying into the building. It's the first thing I looked at as it was a little unnerving in a 9/11 kind of way. I like the green and yellow colour scheme. It looks very friendly and inviting. I also like how you are playing with different shapes of frames and highlights. I like that you put the title of the talk in the middle, but I am not sure about making the equation the center piece. It is a bit distracting and not 100% on topic. Try to pay attention that your frames are not running over your writing. In places they make it hard to read what is inside them. 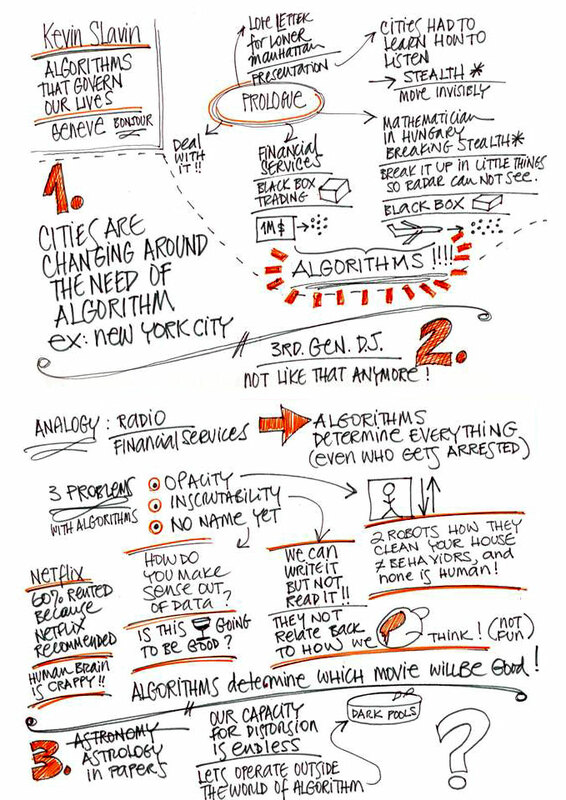 I’d also like to see you using some ordering keywords in bigger lettering to summarise the different areas of the talk. I think and, overall, the flow works well. Additionally, that I used a 2 color scheme. Everything! The hand writting! I would add more images/doodles and reduce the number of words. Also, I think I added some information which was not needed (and I am sure I left out another info needed). I think that there should be a strong focal point, which is missing, except for the 1, 2, 3 numbers. Great handwriting! Very clear and easy to read. I like the structure, which is clear to follow, especially with the highlighted numbers. Nice use of the swooshy separators for each section. Love the honesty of just stroking out "ASTRONOMY" under number 3. Really like the integration of the icons within the text. It's interesting to follow your structure. Point 3 felt a little compressed - which makes points 1 and 2 more detailed than 3. That's often tough to gauge though, so it is very understandable. Would love to see your illustrative style made more of an emphasis - it feels very verbal (which is OK) but as I see your simple illustrations, I want to see more of them and larger. love your handwriting and organic sense of flow and connection. Would like to see more visual hierarchy—using varied type size or containers to highlight important ideas. Visual anchors like icons or drawings would help reduce density of information as well. I really like the layout, actually. It's mostly vertical, but it has elements of a radial design embedded in there. I also really like your handwriting and the alternating between upper and lower case characters works for me. And the red highlights are effective but not overdone. I'd like you to be braver about capturing concepts using images—you've probably heard it before, but if you work at building up your visual vocabulary for common phrases, then you won't have to think so hard about whipping one of them out when you need it! Also, I think you could explore some different typographic options. Even if you gave some of your headings more weight, so they were thicker and darker, then it would give your page hierarchy some variety. I love your handwriting. very nice letter shapes, really clear, neat and friendly looking. Your use of colour is very nice as well. The few but well placed splashes of red for the big numbers and the rays around the word ‘ algorithms’ are a great way to guide the eye through the page. The big points that sit next to the red numbers actually don’t quite seem to capture of summarise the gist of each part as I would have liked or expected. I suggest you leave some room during the presentation to add a summarising statement a bit later when you get the big picture of each part. I’d also love you to get in a few more sketches. Your sketches look really nice and confident, so try to break out of writing a bit more often and visualise more of the concepts.